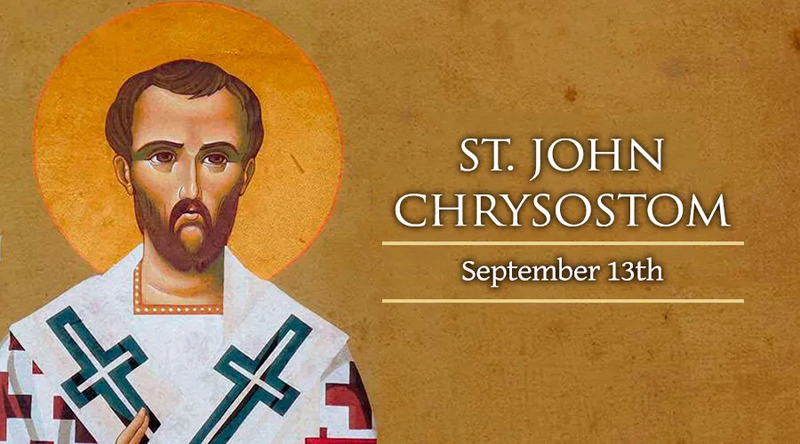 Born in Antioch, c. 347, Saint John Chrysostom (Golden-mouthed) was perhaps the greatest preacher in the history of the Church, thus the name given him, and the most prominent Greek father of the Church. He grew up in Antioch, received an excellent classical Greek education, and upon meeting the holy bishop Meletus, he decided to devote his time to the study of religious works and the Sacred Scriptures. He received Baptism after three years of study and set out for the desert to live the ascetic life of a hermit. His extreme mortifications left him in fragile health, and he thus returned to Antioch after two years of recovery, and devoted himself to studying for the priesthood. He was ordained in 386 and served in the Cathedral of Antioch for 12 years, winning widespread fame for his sublime preaching. In 398 he was forcefully appointed Patriarch of Constantinople, and fast became very popular with his flock through his example of preaching and courage in front of the imperial power, whose corruption and decadence he never shirked from criticizing in public. This attitude naturally made an enemy of the empress, Eudoxia as well as Theophilus, bishop of Alexandria, who had him condemned on false charges in 403. He was exiled to Armenia where he continued to be a great presence in the Church of the East through his many letters. He was exiled from Armenia to an isolated place along the Black Sea. He died during the journey in 407 in Pontus, his ill health unable to endure its rigors. In 438 the Emperor Theodosius II of Constantinople had John’s body returned to Constantinople, and did penance for the sins of his mother Eudoxia. Chrysostom's many writings, especially homilies and commentaries on the Gospels, are still extant and have exerted great influence over the centuries.